Today we’d like to introduce Rob Foster, our very first Imaginect recruited employee (pictured below, in the middle). What’s Imaginect (pronounced imagine – eckt)? We’re glad you asked. Imagine!’s service delivery is very labor intensive. The unemployment rate in Boulder County is at historically low levels, making finding qualified workers challenging. In addition, many in our growing elderly population desire personal supports that are similar to the personal supports for those with I/DD. This means that for the foreseeable future Imagine! will be facing increased competition for services coupled with a shrinking workforce available to provide those services. In short – we’re short workers and need to find more. To address this critical need, we have reimagined how (and who) we recruit to fill these positions by developing an app called “Imaginect,” which takes an Uber style approach to employee recruiting, engaging a team of on-demand employees pulled from typically underutilized labor pools such as college students or retirees. 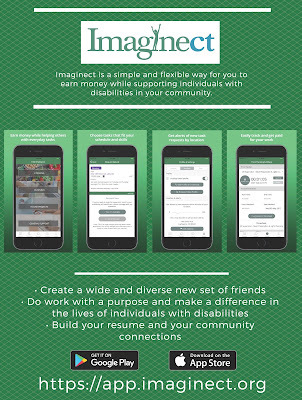 Imaginect is about flipping Imagine!’s approach to workforce recruiting on its head. Currently, Imagine! caregivers are hired “one size fits all” - employees who are expected to work standard 8-hour shifts performing direct care duties as well as tasks such as cooking for clients and cleaning homes. Imaginect assigns tasks such as cooking, janitorial work, or simple care giving duties to the on-demand employees. Since these tasks don’t require full shifts, the on-demand employees can use Imaginect to select times, dates, and locations convenient for them, vastly increasing our available labor pool while tapping into the CU-Boulder student population. Using this labor pool for these tasks frees up time for full-time employees to focus on other tasks designed to allow individuals we serve to become active, participating members of their communities. Imagine! is currently testing this app at one of our residential sites – that’s where Rob will be working. Eventually, we plan to use this app to bolster our workforce for our day services such as employment services and life enrichment classes for adults with I/DD, and early intervention services, after school, and summer camp programs for children with I/DD. In the spirit of self-determination and self-directed services, we also hope for a future where families will use Imaginect to direct their own trusted and qualified workforce to meet their unique needs. 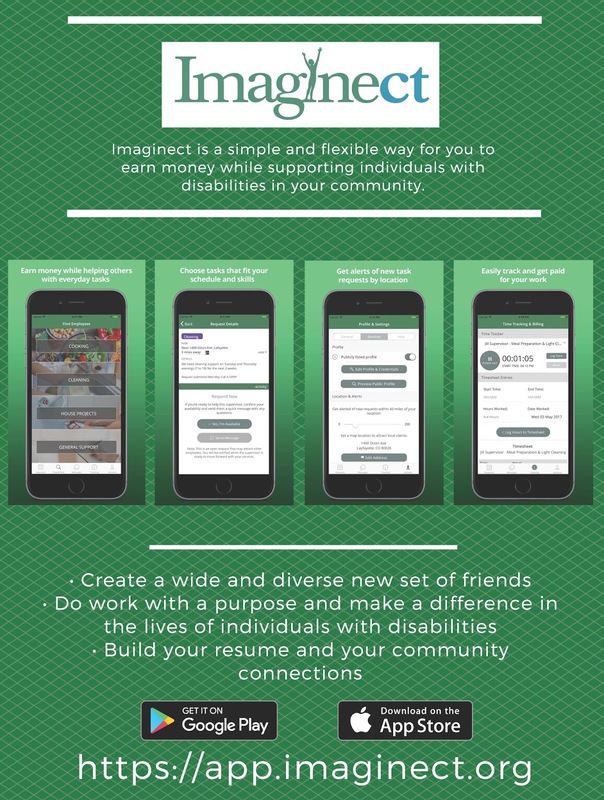 We’ll keep you posted as we move out of the testing phase and move toward fully engaging Imaginect as another tool designed to create a world of opportunity for all abilities.